Tuesday, 17 May 2011, Day 175/365. This puppy above hung out with me for two days this week. It works like this. 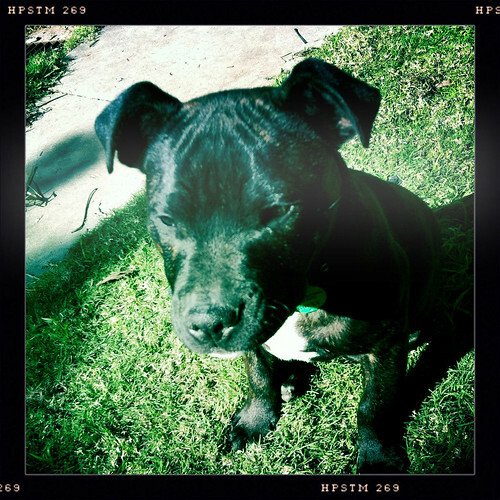 His dad, The Surfer, stayed at my place on Tuesday night so dropped his puppy off at mine Tuesday morning and picked him up on the way home Wednesday afternoon. He lives too far away to make it viable to pick him up after work for a sleepover. The photo above was taken during a quiet moment when he wasn’t hassling my dog. On Wednesday my sister’s dog came for a day stay and the puppy just barked at him a lot. My sister’s dog wouldn’t play but the puppy wanted to so was letting him know this by continually barking at him. That is when he wasn’t jumping all over him. It would have been funny if it weren’t so annoying. I separated them for a while and by early afternoon they finally settled down with one another and I had some peace. Meanwhile the heat was taken off Monty so she was able to sit back and just watch it all. Luckily she’s pretty deaf so didn’t have to put up with the barking like I did. And because I’d moved Monty’s cane basket out the way of the puppy who likes to chew, Monty took it upon herself to sleep on the puppy’s mat. Poetic justice, because he quite likes sleeping in her basket. As much as I love the dogs it was good just to have Monty back to myself without any of the others around.